Looking for a fun board game for dog lovers? 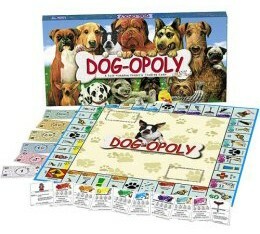 Whether for yourself or as a gift for someone else, Dog-opoly is your answer! Check out Dogopoly — a fun game that’s modeled after the classic Monopoly game. Dogopoly is a great family board game. It’s just like the classic Monopoly game, but with a dog theme!